⚓ T35062 Creates a hair system with hair guides derived from mesh objects. Creates a hair system with hair guides derived from mesh objects. "Like" token, awarded by aniruddha. HairNet lets users create simple meshes to define the basic shape of a hair system. If a simple mesh plane is used as a starting point, one edge of the plane is marked as a seam. This edge will be the root from which all hairs start and each edge loop that intersects it will become a hair guide. Multiple meshed can be used as long as the number of vertices in each "guide hair" in every mesh is the same. Rhett Jackson (jandals) attached 1 file(s): Unknown Object (File). Version 0.2 does some extra checking so that HairNet can manage multiple hair systems, each derived from a separate mesh object. 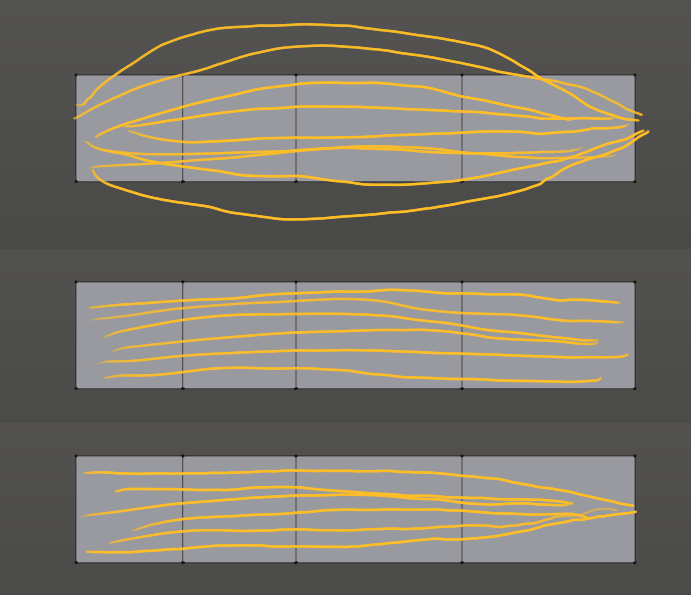 Version 0.4.5 adds a button for converting curves (without bevel objects) to hair systems. Whenever I add a second hair system, the particles/points of the first hair-net-generated hair system are all moved slightly, despite touching every one in particle edit mode to "lock" them in place. Thank you khtrammell. The problem was created by having the script disconnect and then reconnect the hair system while moving all the hair vertices into place. I was able to observe the same effect manually by clicking (twice) the "Disconnect Hair" button which appears when combing hair in Particle Edit Mode. It appears to have been an unnecessary step so the script no longer does it. 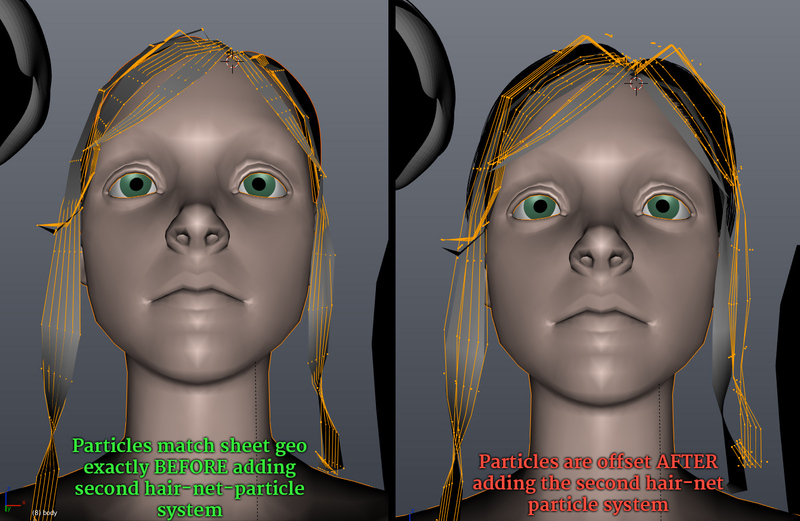 Version 0.4.5 required users to manually select a particle system that matched the name of the mesh object being used as a guide. Version 0.4.6 will find and use a matching particle system for you. Generate the hair from geo to test the final look. It only took a couple redo’s to realize that the majority of default hair settings never work, and remembering/re-imputting them in each time was a big hinderance. So I began to maintain a quick script for ‘saving’ the settings I tweaked each time. Now when I generate the hair I can simply click ‘run script’ and the hair updates with my ‘preset’. That worked well enough yesterday. Tag each hair proxy object with a preset. In the Hairnet UI perhaps there could be a small info section displaying the tags of the active object. Automating Hairnet generation to allow multiple selected hair proxy objects to generate their own particle systems with settings according to their tagged preset. A checkbox for subdividing the hair proxy(s) before generating hair from them. In order to maintain their editability at thier low resolution I recommend the operator duplicates each proxy first, adds and applies a subsurf modifier, generates hair, deletes duplicates. What do you think? If you don’t have the time or don’t share the interest, I certainly understand. I am grateful for the feedback you have from using HairNet in a workflow that demands a higher level of performance than I can test for. I'd enjoy working on the script to make it more useful and your input is will be very meaningful. Storing hair settings in presets - I agree that this would be useful. As it is, I am not sure what means I have to store a template within the script. In my mind, Blender already has a way to save hair settings in a blend file so I imagined that the easiest way to do what I think you are describing would be to maintain a "hair library" blend file. Using Blender's existing capability would involve Appending the desired hair preset from another blend file, then renaming the hair system's settings to match the name the HairNet looks for. It would be sort of like a settings transplant. I would like to see the "quick script" you are using so I can get a better idea of the work it is doing for you. That'll help me figure out how much I can do within HairNet itself. Automate hairnet generation - Yes! After this last revision, HairNet is a bit smarter about connecting a proxy object with its hair settings. It should be quite easy to update it further so that all proxy objects can be processed at one time. In my mind, tagging them might end up being redundant. That will become clear as we correspond a little more. I can see the usefulness of a workflow which lets you assign a "curly bouffant" hairstyle to proxy object #1 and make that association stick so you don't ever have to redefine a hair style's settings. I *think* that "transplanting" hair settings as I mentioned would achieve that but you would know better than I. If it is necessary to pre-tag objects with a hair style, it ought to be possible. I have done something like it before so HairNet should be able to make a list of proxy-object->hair-style pairs for each object. Subdividing proxies - Definitely yes. I would really like to be able to do this. Earlier this year, someone made a similar suggestion and I don't yet know a reasonable method to approach it. One question I have is whether it would be helpful or harmful to have it subdivide in only one direction (ie. to multiply the number of guide hairs but not the number of points in each hair). Using a subsurf modifier would multiply geometry in both directions and doubling the number of control points in each guide hair may not always be desirable. Those are my first thoughts. I hope we can keep this going and I'll look forward to hearing more from you either here or via email. 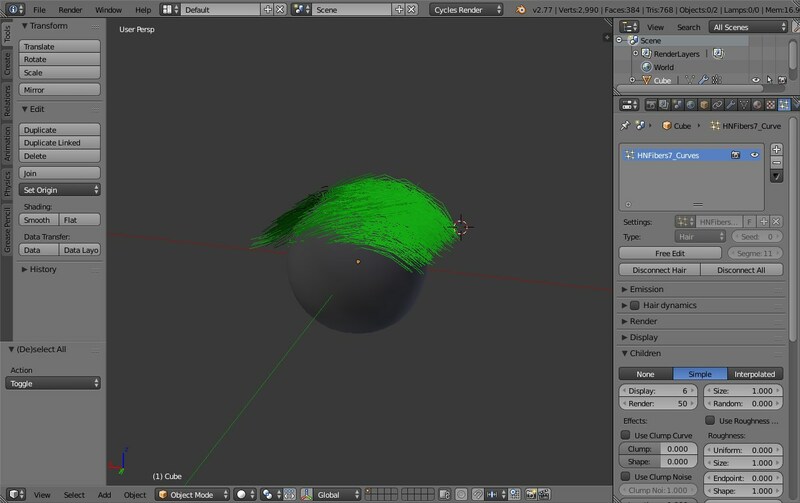 I found this script for maya http://www.thundercloud-studio.com/index.php?page=shop%2F1.script%2F0.GMH2 and i was impressed when i found HairNet too. @Rhett Jackson (jandals) could we improve the HairNet based on Maya's script? This will solve some issues as we can use the same hair on a polygon and we don't need to move hair's orgin. Also we can put a integer value how many hairs will be generated on the mesh. Sometimes it;s ok to have 3 hairs and sometimes it's ok to have 30 hairs. You can see on side view a bit thickness. Also, could you put your work at github? I could help you with some programming and could make pull requests. Also, what's license of your script? 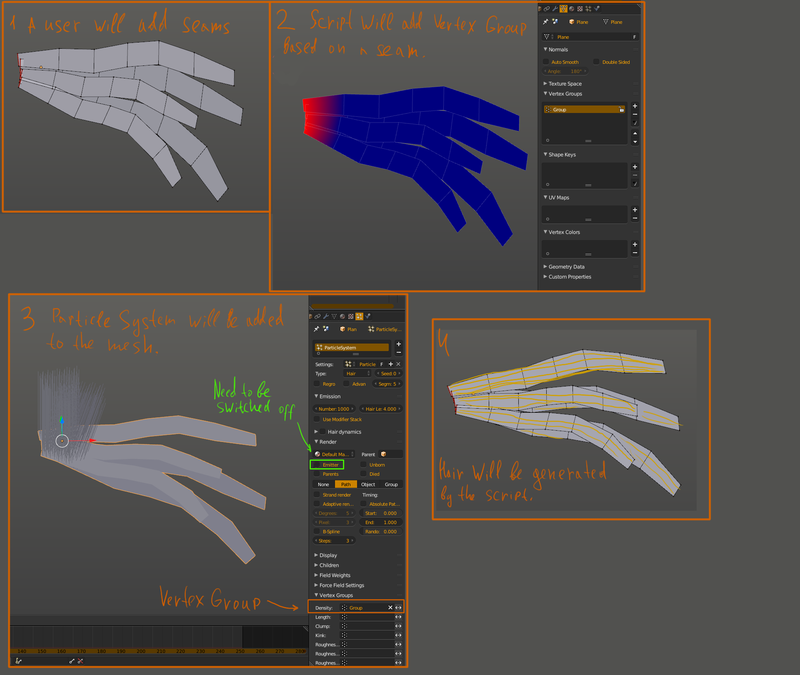 You can also see some examples maya's script here http://3dpapa.ru/gmh2-script-by-thundercloud-studio-creates-maya-hair/ . But sorry it's in russian. @paul geraskin (mifth) Thanks for making suggestions and sharing the examples. There are a lot of good ideas there. I hadn't considered attaching the generated hair to the proxy object and I can see how useful it would be. I have added that as an option so users can put the hair systems on either the proxy objects or on a separate "head" object. I had always intended that the script would be GPL but I haven't made it official. When I get the code on GitHub, I'll get in touch with you. Thank you for offering to help out. @Rhett Jackson (jandals) Thanks for answering. Waiting you on Github. 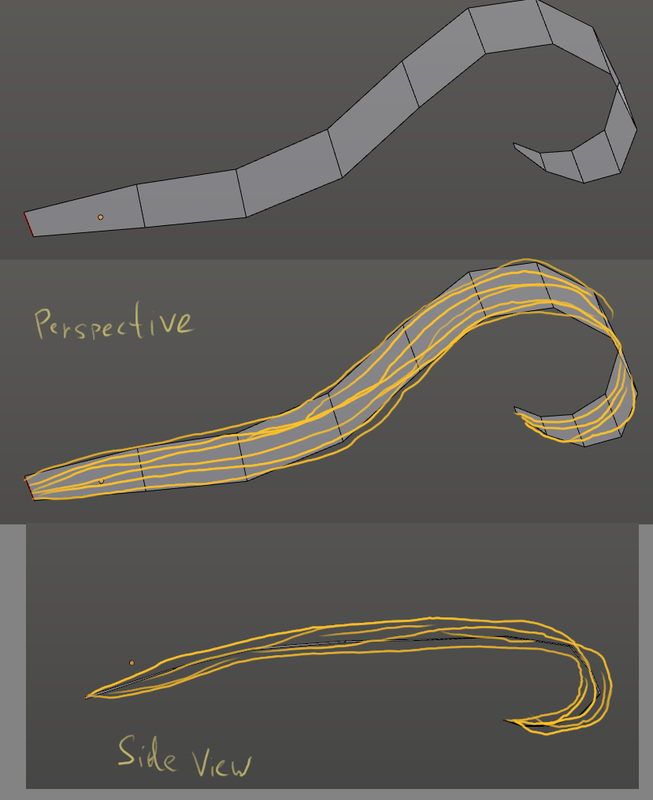 I'm certanly sure that we can make the same quality tool as Maya's one. You already did good job! Hair can be created from disconnected meshes in a single object. Returned to a more Blender-like interface. The last object selected receives hair from proxy objects. Some selections will cause errors when HairNet is not used as intended. It still needs a way to handle them without failing. The current version doesn't seem to work with fibermesh from ZB. This worked with past versions (quite a while ago). I'm selecting the fibermesh object first, then the hair emitter, then clicking 'Add hair from Fibers'. I'm using the latest from https://github.com/Jandals/HairNet. Thanks for reporting, Frederick. I'm glad to hear HairNet is useful to you. It sounds like I broke a connection to one of the helper functions. I'll try to find time this week to sort that out. I fixed the error Frederick reported. Converting from fibers should work like it used to do. Tried the latest and my initial test seems to work! Thanks! Advanced option not available: Clicking the advanced hair checkbox before the initial combing will make the guide hairs lose the fibermesh styling. However, the initial combing makes the advanced option is unavailable. Switching to interpolated children mode will make the guide hairs go a bit crazy. Those are both properties of Blender's hair system. I don't think the addon can do anything about them. I think that combing overrides the settings available when "advanced" is checked so Blender disables it when you manually edit particle hairs. Interpolated child hairs follow the guide hairs loosely because they are filling-in the spaces between guides rather than just following their parent hair. Where is the best place to get the latest version? The "Local Download" and the external link to github.com should both lead to the most recent version. As far as I know, the plugin still works. I haven't tested it in a while so I'll have to find some time to make sure. The instructions in the wiki page and the addon itself should still be valid. hi @Rhett Jackson (jandals) If your interested I'm putting some addons from the tracker into contrib, maybe you could double check this is still working ok? Thanks for your interest, Brendon. I have done a run-through and it appears that Everything still works fine. hi, I've committed this to addons contrib so it can be a part of the 2.79 addons contrib pack, sorry for the late run. It's possible we may change how contrib works in 2.8 series so I cannot guarantee the addon inclusion past 2.79 & the last of the series. If you have any updates please post to this task or create a new task. Thanks for your participation & welcome. We look forward to seeing you again in the 2.8 series. Hi Eduardo. Thanks for the comment. I would like to make sure that HairNet works in 2.8 but, as you may have guessed from my delayed reply, I haven't got much time to commit to it right now. I wish I had a timeline for keeping it current, but I can't predict what it'll take to update to 2.8. But updating HairNet is on my mind and I'd like to add a few features to it. But I haven't yet got a plan to make it happen. Yuriy (YuriyKozachok) added a subscriber: Yuriy (YuriyKozachok). Hello, dear Rhett Jackson (jandals)! I really need a working version of the add-on for Blender 2.8. Is it planned to be updated and when ? Waiting for an answer, Yuriy. Please leave old tasks closed. I'm a bit new to this, but I sent a pull request with changes I made to make this work with 2.8. Please give version 2.8 if you already have one. Please note that I only changed the code to make it work with 2.8, i.e. I just made it stop throwing up errors. I have not fixed any issues that it might of had or added anything. It sounds like Nicholas and I have done the same job. When I clear out everything that throws up an error, HairNet doesn’t move hair particles into place because of a bug in Blender that has not yet been addressed. I’ll look at Nicholas’s changes, in case he’s done something different than I have, and I’ll try it with the latest build of Blender, in case the bug we’re waiting on has been resolved. I installed Nicholas version, it says upgrade to 2.8 required, despite not throwing any errors, hairnet option is not enabled so i can not used it. Time will solve this good day!